Cufflinks evolved from the "cuff strings" of the early 1500's. 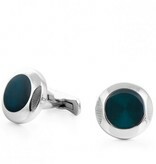 Today, most dress shirts have buttons, but the most formal of men's shirts still require a pair of cufflinks. Cufflinks by HELVECO, all of-which are made of high quality stainless steel, stand out among the others in Their unique designs meeting the tastes of the most demanding. HELVECO cufflinks are for People that appreciate what true luxury is all about: exclusive designs, exceptional quality, immense attention to detail and an eye-catching presentation.